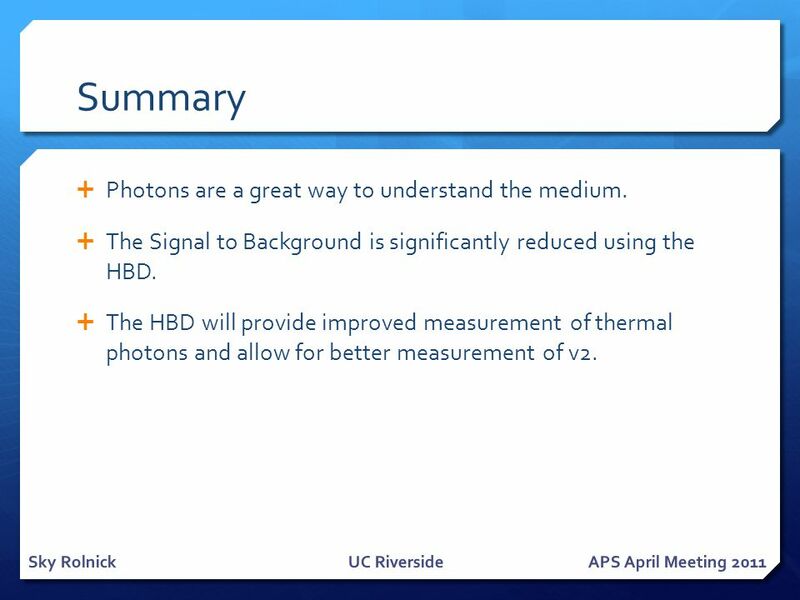 Thermal Photon Measurement using the HBD in PHENIX :Status and Update Sky RolnickUC RiversideAPS April Meeting 2011. 6 HBD Performance Estimate from Run-9 p+p: StepBckg. 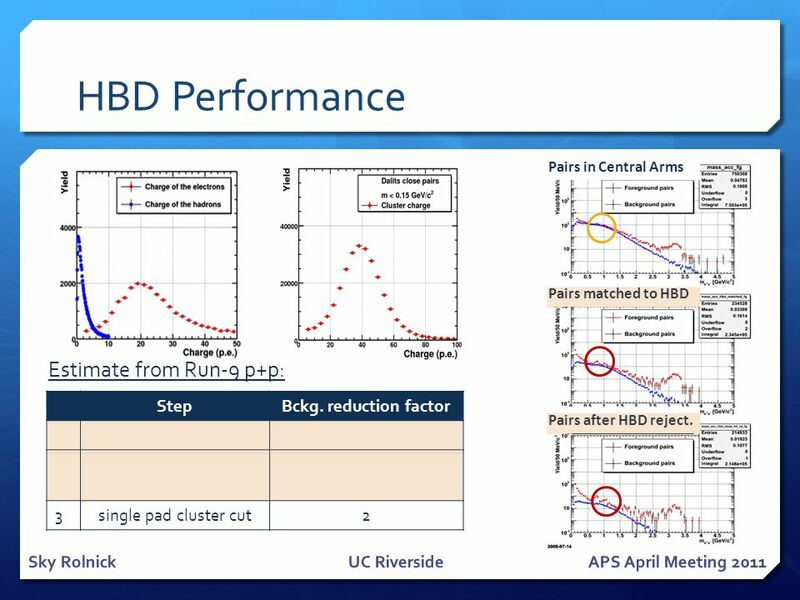 reduction factor 1matching to HBD7.1  2.2 2 double hit cut close hit cut 6.5 3single pad cluster cut2 Sky RolnickUC RiversideAPS April Meeting 2011 Pairs in Central Arms Pairs matched to HBD Pairs after HBD reject. 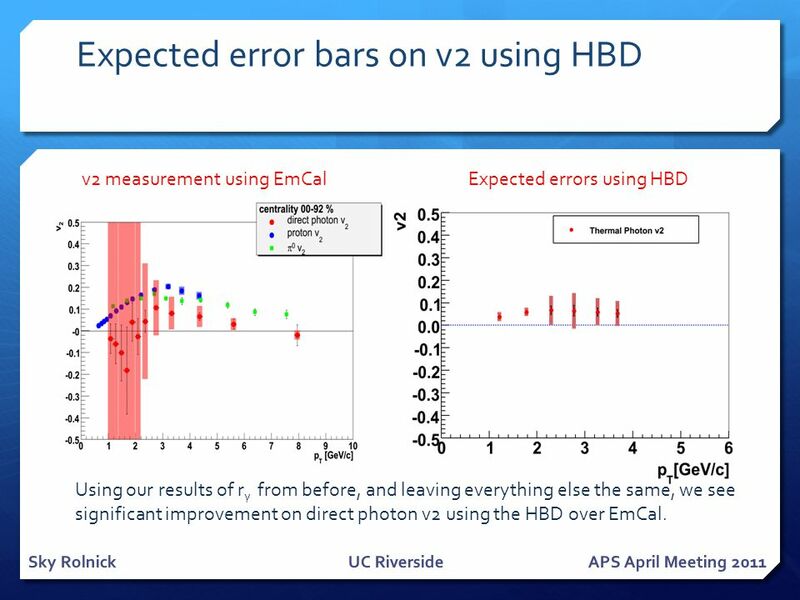 11 Expected error bars on v2 using HBD Sky RolnickUC RiversideAPS April Meeting 2011 Expected errors using HBDv2 measurement using EmCal Using our results of r γ from before, and leaving everything else the same, we see significant improvement on direct photon v2 using the HBD over EmCal. 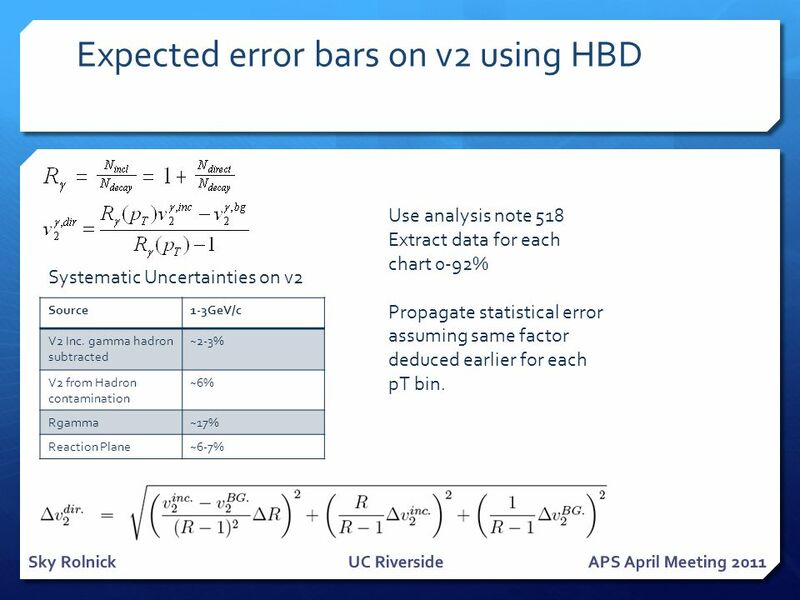 16 Expected error bars on v2 using HBD Sky RolnickUC RiversideAPS April Meeting 2011 Source1-3GeV/c V2 Inc. gamma hadron subtracted ~2-3% V2 from Hadron contamination ~6% Rgamma~17% Reaction Plane~6-7% Systematic Uncertainties on v2 Use analysis note 518 Extract data for each chart 0-92% Propagate statistical error assuming same factor deduced earlier for each pT bin. 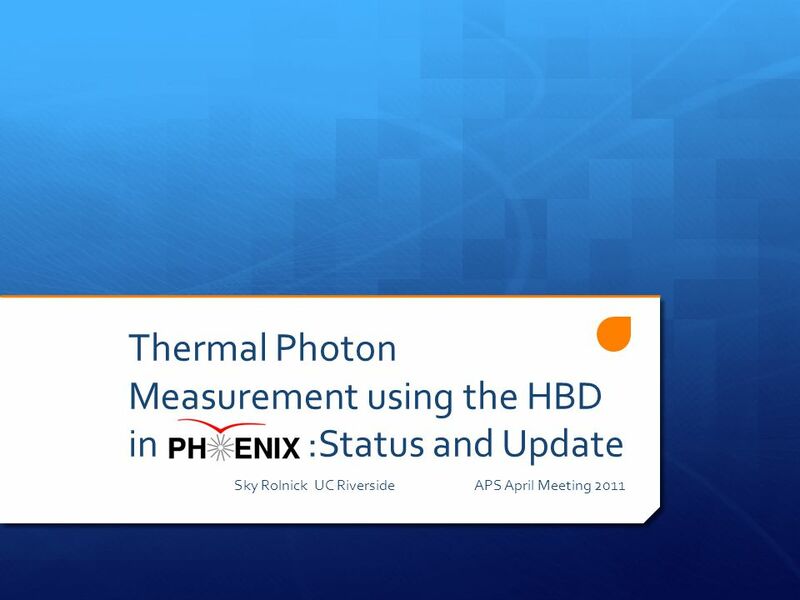 Download ppt "Thermal Photon Measurement using the HBD in PHENIX :Status and Update Sky RolnickUC RiversideAPS April Meeting 2011." 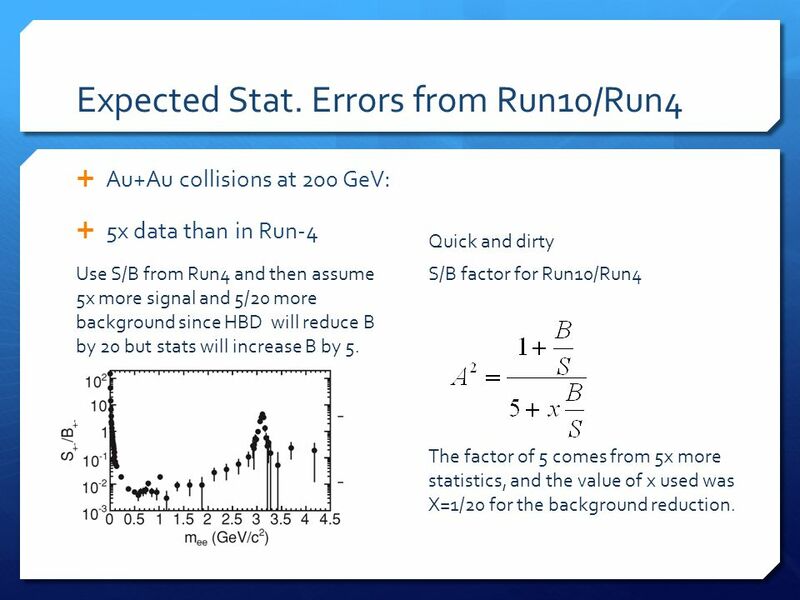 1 Jet Structure of Baryons and Mesons in Nuclear Collisions l Why jets in nuclear collisions? 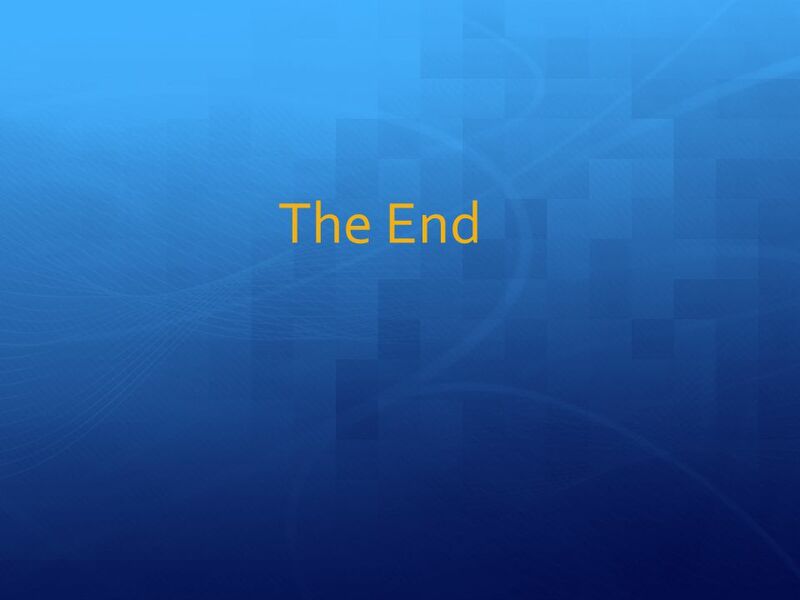 l Initial state l What happens in the nuclear medium? 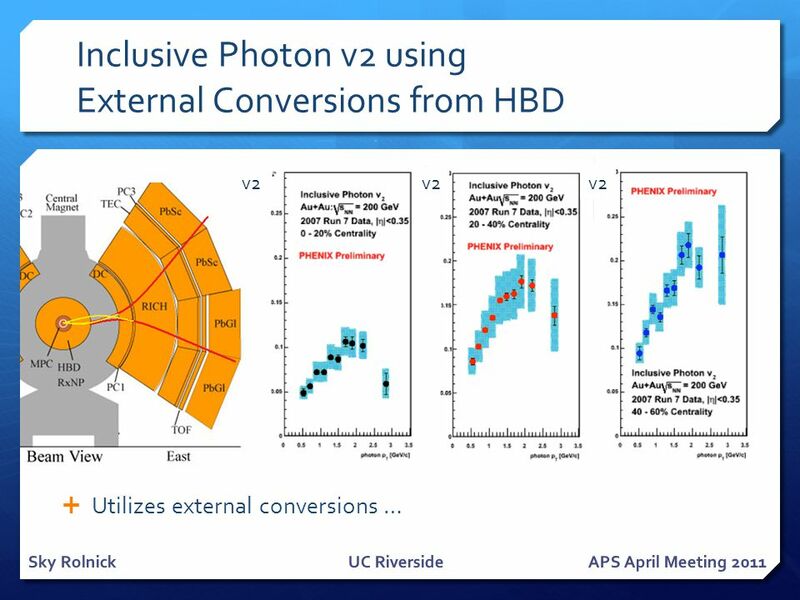 l.
Benji Lewis APS April Meeting Hadron Blind Detector implementation during PHENIX Run-10 Benji Lewis On behalf of the PHENIX Collaboration. Yorito Yamaguchi For the PHENIX collaboration CNS, University of Tokyo 10/14/2008ATHIC2008 1/13. 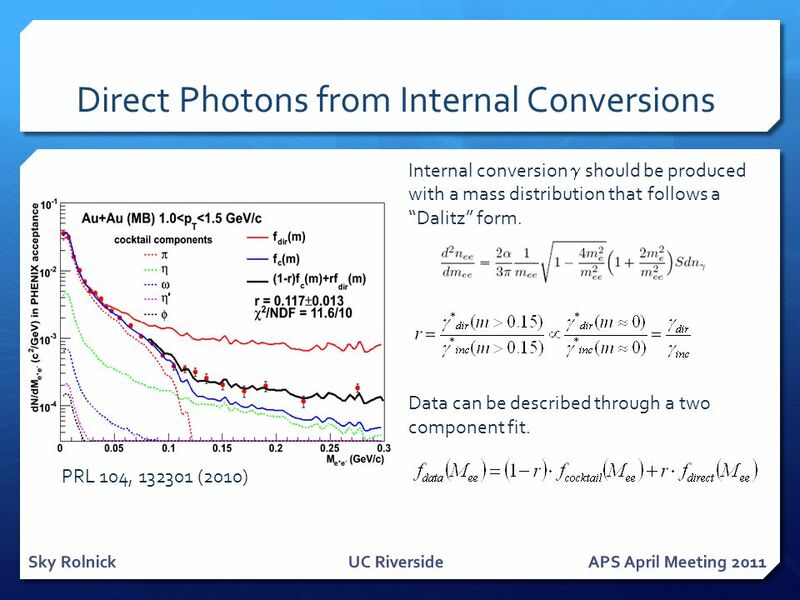 Fukutaro Kajihara (CNS, University of Tokyo) for the PHENIX Collaboration Heavy Quark Measurements by Weak-Decayed Electrons at RHIC-PHENIX. 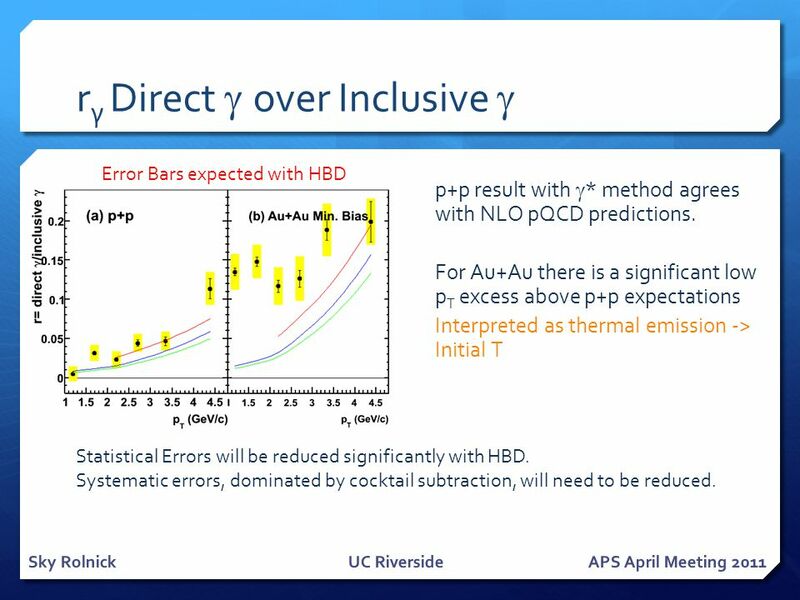 Results from PHENIX on deuteron and anti- deuteron production in Au+Au collisions at RHIC Joakim Nystrand University of Bergen for the PHENIX Collaboration. Di-electron Continuum at PHENIX Yorito Yamaguchi for the PHENIX collaboration CNS, University of Tokyo Rencontres de Moriond - QCD and High Energy Interactions. The Azimuthal Anisotropy of Electrons from Heavy Flavor Decays in √s NN =200 GeV Au-Au Collisions at PHENIX Shingo Sakai for PHENIX Collaborations (Univ. 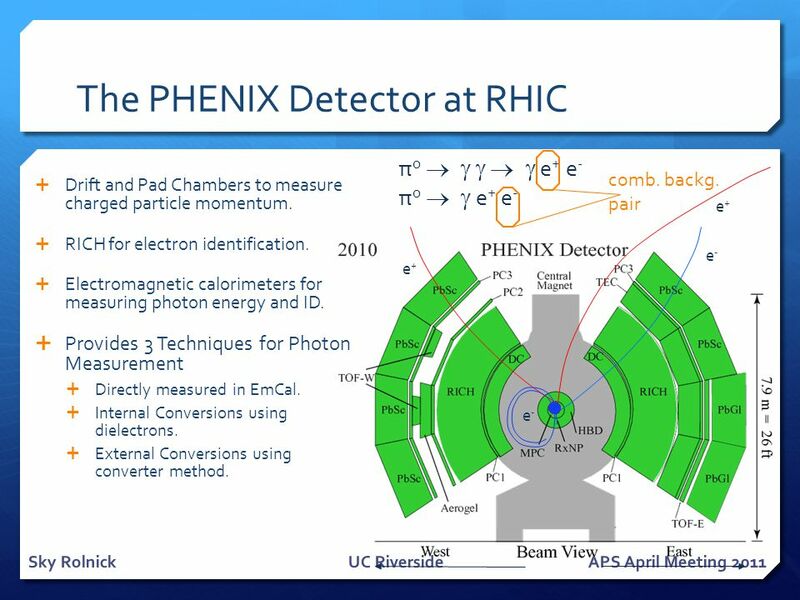 Measurement of Direct Photons with the PHENIX Detector at RHIC Richard Petti For the PHENIX Collaboration Department of Physics and Astronomy Stony Brook. Direct-Photon Production in PHENIX Oliver Zaudtke for the Collaboration Winter Workshop on Nuclear Dynamics 2006. 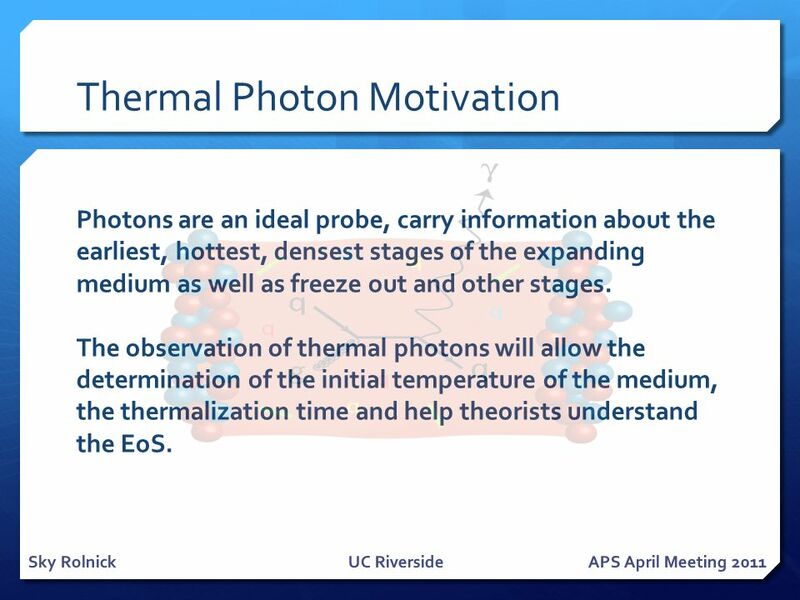 Search for Thermal Photons in PHENIX - Torsten Dahms - Stony Brook University 23 rd Winter Workshop On Nuclear Dynamics February 13, 2007. Sourav Tarafdar Banaras Hindu University For the PHENIX Collaboration Hard Probes 2012 Measurement of electrons from Heavy Quarks at PHENIX. 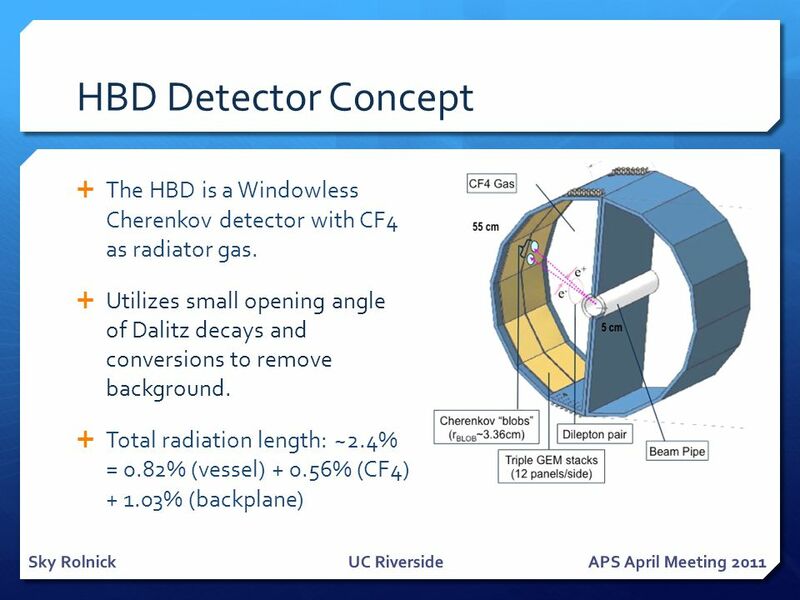 1 The Study of D and B Meson Semi- leptonic Decay Contributions to the Non-photonic Electrons Xiaoyan Lin CCNU, China/UCLA for the STAR Collaboration 22. 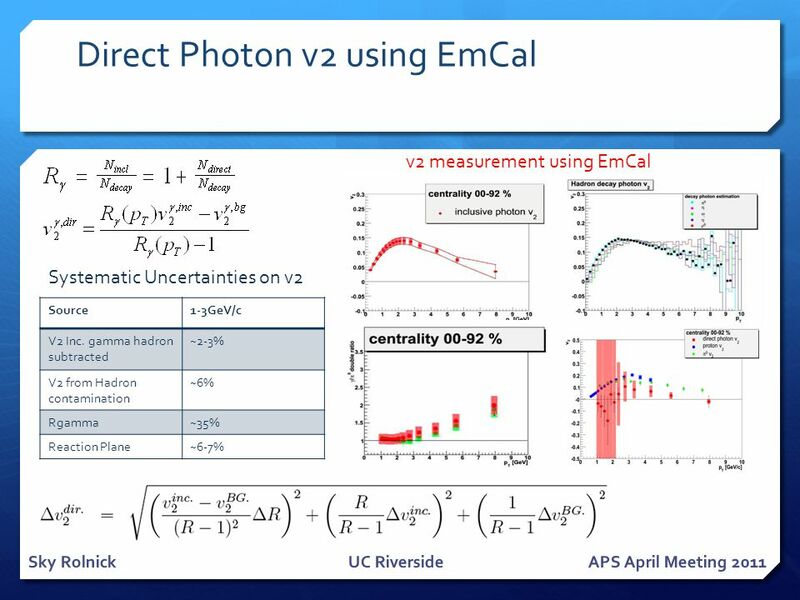 Centrality Dependent Soft Direct Photon Yield and v n Measurements by PHENIX Richard Petti (BNL) for the PHENIX Collaboration QCD Chirality Workshop 2015. 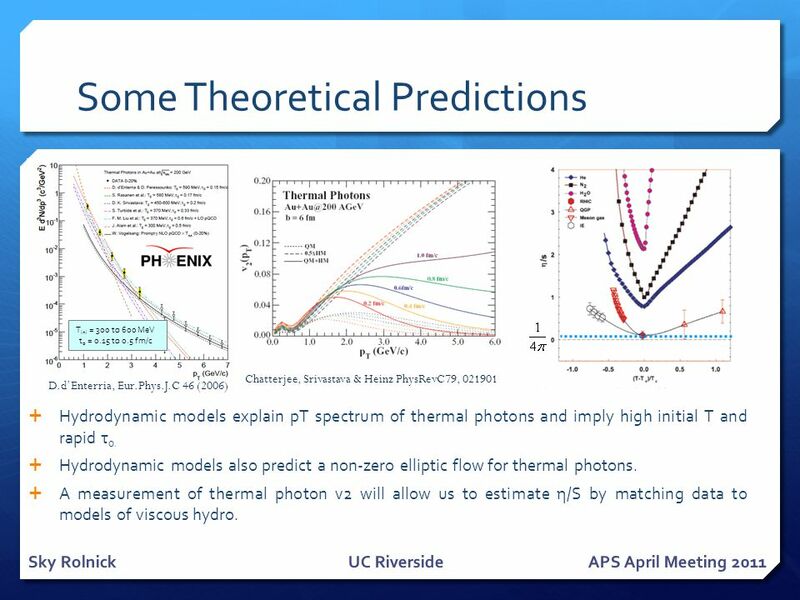 PHENIX measurements of reaction plane dependence of high p T photons and pions in Au+Au collisions Vladislav Pantuev, University at Stony Brook for PHENIX. J. Zhao Hard Probe 2012, Cagliari 1, Lawrence Berkeley National Lab, USA 2, Shanghai Institution of Applied Physics, CAS, China Di-electron Production.